OK, I’ll be the first to admit that I don’t use LinkedIn that often. But what I do use is the site’s iPhone app for when I’m getting ready to step into a meeting. According to LinkedIn’s Head of Mobile Product Joff Redfern, I’m not alone. At the end of Q4 2011 15% of the daily visitors to LinkedIn.com came via mobile. At the end of Q1 2012, that number had grown to 22%. With those numbers in mind, the team has come out with a brand new mobile apps, and the iPad version is simply brilliant. 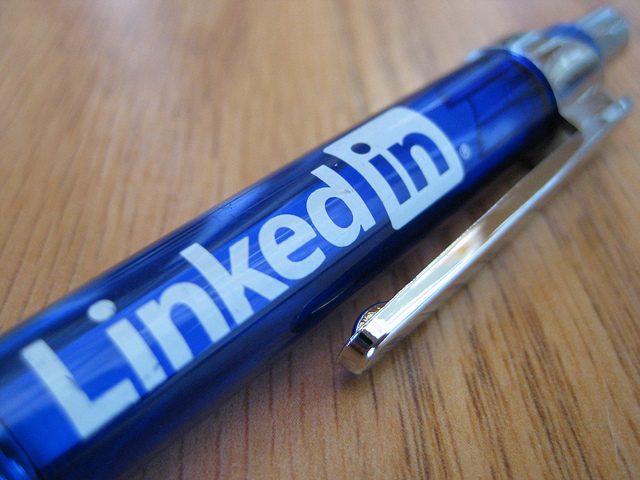 The mobile platform is the fastest-growing consumer service at LinkedIn. In fact, the site sees 19 people searches every second via mobile devices, and 41 LinkedIn profile views every second across its current 150 million members. When you’re talking about devices, the iPad has been the fastest grower, up 250% year over year from 2011. But Redfern does say that the iPad is being used more as an “infotainment” device, given the timing that people are using it through the day. LinkedIn sees a massive spike during what would be considered TV prime time, when people are watching shows but checking email and otherwise connecting via their tablets. 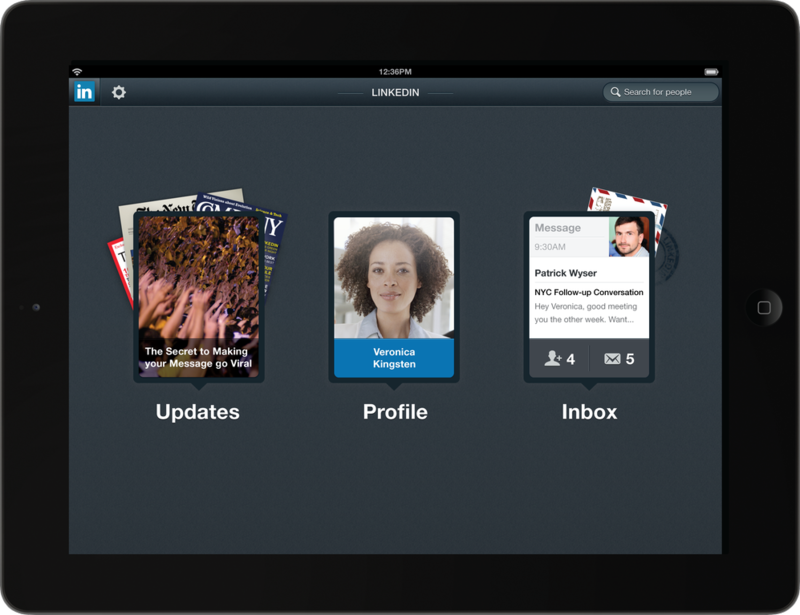 LinkedIn wants to change that trend, and so the iPad version of the universal binary is set up to act something like a personal assistant. You’ll start at your Hub page, where you’ll see trending topics, job moves, stock quotes and even an overview of the weather, in answer to “the jacket question”. From here you can move to your Expose, Stream or individual profile views. 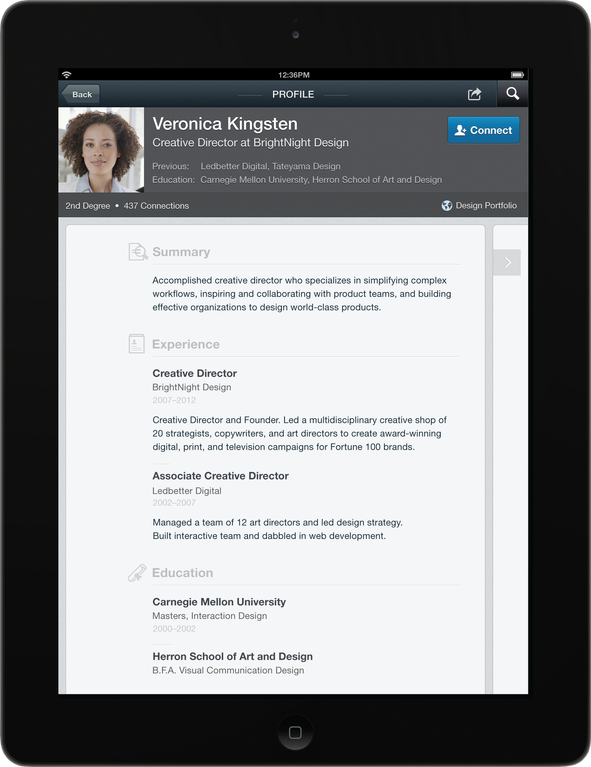 But what’s really huge is how your daily calendar can now interact directly with LinkedIn. If you give the app pemission, it will pull in your personal calendar and match it with your LinkedIn contacts. So if you’re meeting someone for lunch and want an ice-breaker that’s different than talking about the weather, you can now connect to see what they’re posting about to LinkedIn. That’s some pretty useful information with which to start your day. But you’re not out of luck when you leave your iPad at home. The new mobile apps for Android and the iPhone have the calendar connection function as well. They didn’t get a major update, but the calendar function alone is enough to warrant an upgrade to the newest versions. 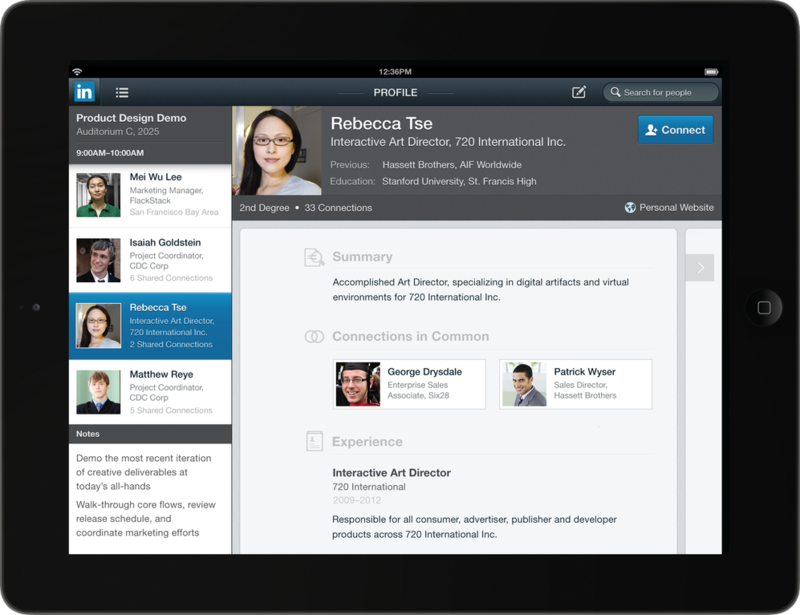 My first thought on seeing the revamped iPad app was that this is how I wish the rest of the LinkedIn site would operate. Something about it seems much more in tune with a touch interface than the clicks and menus that we see today. 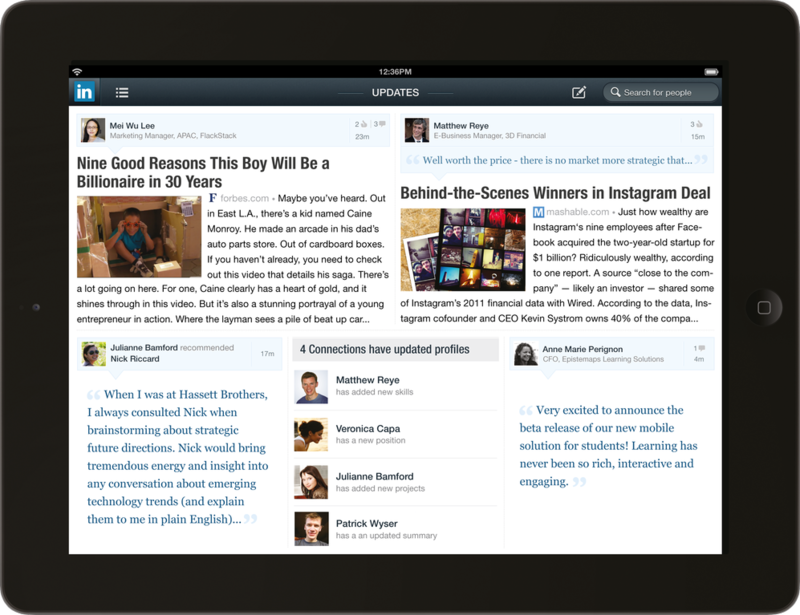 Perhaps we’ll get some carry-over in due time, but right now the iPad app is an absolute standout. The apps are free, and they’re live right now. So you can download them for iOS (as a universal binary) or for your Android phone. It’s the first time in a while that I’ve been really excited about something that LinkedIn is doing, and I’d love to know your thoughts.